Sometimes, in a busy week, students will do some writing about a book we’ve read or an activity we’ve done and I don’t get a chance to read it that same day. When I open up the Response and Ideas books a few days later, I sometimes find absolute undiscovered treasures. The same feeling like when I find money in my pocket. It was there all along; I just hadn’t uncovered it. And when I do, wow! This writing has been hidden away in notebooks for a week and now must be shared! 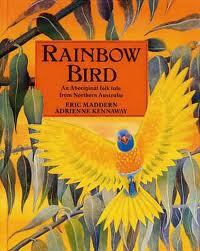 Today, I began reading student responses to Rainbow Bird – An Aboriginal Folktale from Northern Australia by Eric Maddern and vibrantly illustrated by Adrienne Kennaway. Thank you to our Teacher Librarian, Ms. Sheperd-Dynes for recommending this title. Rainbow Bird is a “pourquoi” tale explaining how humans acquired fire. Long ago, Crocodile Man had fire and refused to share it with any of the other creatures. Bird Woman was able to trick Crocodile Man and steal fire from him. Proudly, she asserts, “Now I shall give Fire to the people.” She flew around the country putting fire into the heart of every tree. From this day onward, people could make fire using dry sticks and logs from a tree. Students in our reading group loved this dramatic story and were eager to write and draw about it. Gary is in Grade 2. His writing shows that he has learned to summarize stories using specific and descriptive language. Truman is a Grade 1 student who has delighted in learning idioms. These idioms snake their way into his writing and show that he understands their meaning very clearly. I laughed out loud reading this! Catriona is a confident thinker and writer in Grade 1. I love how she shares her predictions and questions in her response. It is evident that Catriona utilizes all of the reading powers when she reads or listens to a story. All such different responses to the same story shared together. I am delighted by them all! This entry was posted in Classroom Views and tagged Aboriginal literature, animal interactions, Eric Maddern, fiction, great read alouds, picture books, things kids say by carriegelson. Bookmark the permalink.